No one can deny that New Orleans is a sandwich kinda town, however, all too often, some of the city's most delicious bread-enveloped stars are obscured by the bright, shining, mayo-rich suns that are the po-boy and the muffaletta -- to help remedy this injustice, we've put together a list of a few outliers, amazing sandos that might have escaped your deserved attention. Here are five of our favorites in the Crescent City right now. Okay, fine. We couldn’t help but add at least one po-boy to this list. We’re in New Orleans, for heaven’s sake! 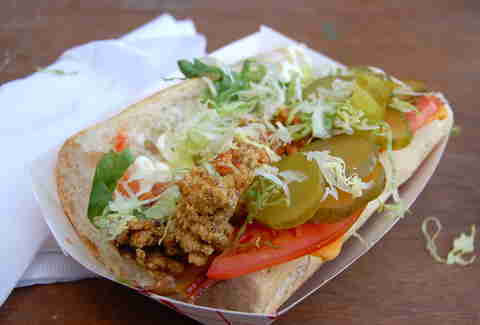 So what, it’s another fried-oyster po-boy, right? Right... but it’s also stuffed with bacon and cheddar cheese, for good measure. It’s a crazy-good combo that will do you no wrong. Well, until too many Peacemakers force you to install a pacemaker. 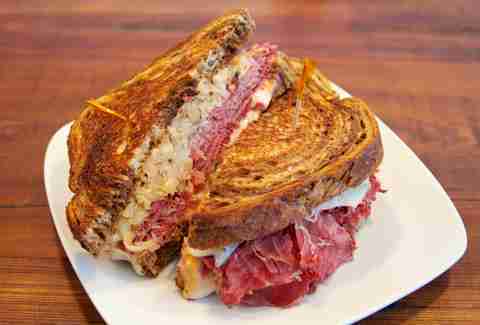 It’s not exactly the newest sandwich invention, but properly executed, a Reuben can be damn near transcendent. We have to give credit where credit is due: Manhattanjack -- with their hand-made, toasted marble rye (!!! ), killer corned beef from Cleaver & Company, and just the right amount of kraut and melted cheese -- knocks this one into the cheap seats every time. 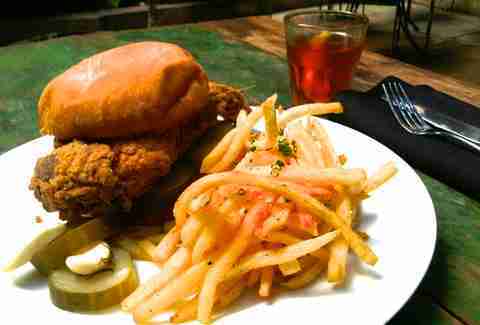 The problem: while Chick-Fil-A's sandwiches are AWESOME, you don't agree with their policy of not giving you a hunk of golden, deep-fried, brined chicken breast so freaking large that it might reasonably require two buns to fully cover it. It's the classic dilemma. The solution: this monster from Sylvain, which they serve on a buttery roll with thick-cut pickles. 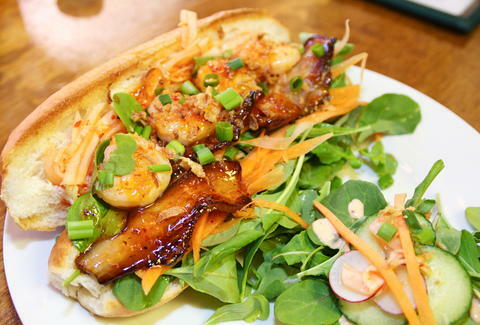 Credit: Yelp / adriana n.
In the past, say, five years, there’s been an onslaught of Vietnamese cuisine in New Orleans that would rival the Tet Offensive (too soon?). 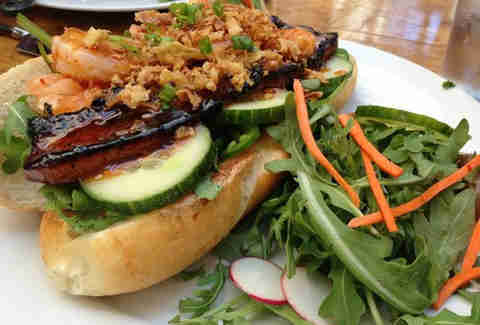 Most represent the traditional banh mi basics, but Chef Paul Artigues at Green Goddess has gone and added succulent Gulf shrimp and savory bacon drizzled in cane syrup, to his Dong Phuong rolls for a superior version. When you think “roast beef sandwich” in NOLA, the dominant thought is going to be one of hot, long-cooked beef, dripping with gravy and “debris”, served on po-boy bread. And, sure, it's incredibly delicious. 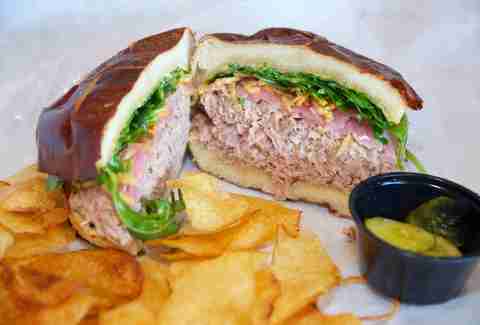 Wayfare, however, has gone in the opposite direction, with cold roast beef, mixed with spicy horseradish aoli, and served on a soft pretzel roll with crispy potato sticks, pickled red onions, and sharp, fresh arugula, and it is just as good, if not better. 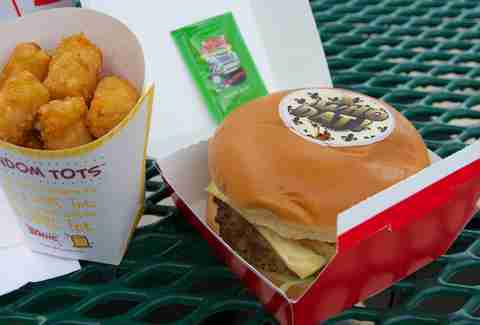 Maybe it’s the Crystal mayo, the fried onions, or the little sachet of Tony Chachere's it comes with, but mostly it’s because you’re a damned Saints fan, that’s why. Stand up and get CRUNK, son!